AmpFlow motors and controllers can be used in industrial machinery or other stationary applications with our high-current power supplies. Connect these units to 110 or 220 Volts AC household power and they will supply 5, 12, 24, 36, or 48 volts DC for use with our motors. Our big 24 Volt, 40 Amp, 1000 Watt power supply can deliver enough current to get all our motors operating at, or near, their points of peak efficiency. If even higher power is required, all the 1000W power supplies have special provisions to enable them to run in parallel with several other units so any level of power can be achieved. These power supplies work well in any application where AC line voltage needs to be converted to DC voltage. Other uses include LED lighting, HAM radio, battery charging, and replacing plug-in AC adapters when more power is required. Every power supply goes through a full-load burn-in test so no defective unit leaves the factory. The built-in fan turns on automatically when the unit gets warm and the power supply shuts down temporarily if the temperature or voltage go beyond the safe operating range. AmpFlow high-efficiency power supplies have an output voltage that is adjustable by plus or minus 10%. And they include an EMI filter to minimize interference with radio signals, and a soft-start circuit that reduces the AC inrush current peaks. Built-in current limiting protects the unit from overloads and short circuits. The current limiting feature enables these power supplies to keep functioning through the high-current start-up surges from DC motors. Most power supplies designed for use with LED lighting or other electronics will simply shut down when exposed to the high current demands of DC motors. AmpFlow power supplies are designed specifically for use with electric motors. Our power supplies will just limit the current to the rated maximum even when a larger load is called for, (like when a DC motor starts up). Also, inductive loads, (like DC motors), can cause damage to power supplies that are not designed for them. If the motor is likely to keep spinning after the power has been turned off, the reverse voltage generated by the motor can cause damage to the power supply. The use of a diode will prevent this reverse voltage from reaching the power supply. Here are sketches for diode placement for Brushed and Brushless motors. In most cases these diodes are not required but they are recommended for applications with high inertia. If more current is required, our big 1000 Watt power supplies can be wired together in parallel. 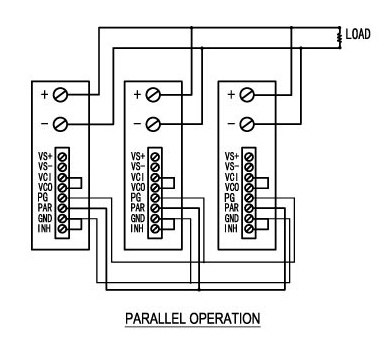 Here is a schematic showing the required connections for Parallel Operation. Operating the smaller power supplies in parallel is not recommended. If more voltage is required, all of our power supplies can be connected in series with the addition of diodes to protect the power supplies if both units do not turn on at the same time, or if the load becomes a short circuit. The diodes will also protect the power supplies from any applied reverse voltage. Here is a sketch showing the diode placement for Series Operation. The diodes should have a current rating at least as high as the power supply. Contact us for Waterproof and DIN rail power supplies and volume pricing.